Weekly “March of the Return” violence continues again. Hamas says 15-year-old killed by Israeli forces. The violent weekly riots along the Israel-Gaza border, known as the “March of the Return”, resumed on Friday. The Hamas-run “health ministry” in Gaza claimed a 15-year-old Palestinian Arab teenager was shot dead by the Israeli army during the renewed clashes. 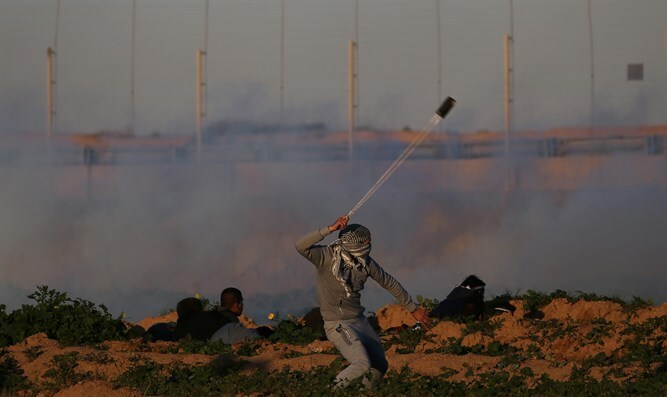 At least 48 others were taken to hospital with a variety of injuries from clashes at several spots along the border, the ministry said without elaborating. An IDF spokesman told AFP that around “approximately 4,700 rioters and demonstrators” took part in various incidents along the frontier. “The rioters were hurling rocks and there were several attempts to breach the security fence,” he said. “Troops responded with riot dispersal means and fired in accordance with standard operating procedures,” said the spokesman, who could not comment on any Palestinian casualties. The so-called “March of the Return” protests along the border have been taking place every Friday for the past year, since March 30, 2018. An AFP correspondent said Friday’s protests were smaller than in the past, when the rioters attempted to infiltrate into Israel, and used kites and balloons with explosives attached in order to set fire to Israeli property. Hamas openly admitted last year that most of the Gazans who have been killed in the border riots were members of the group.